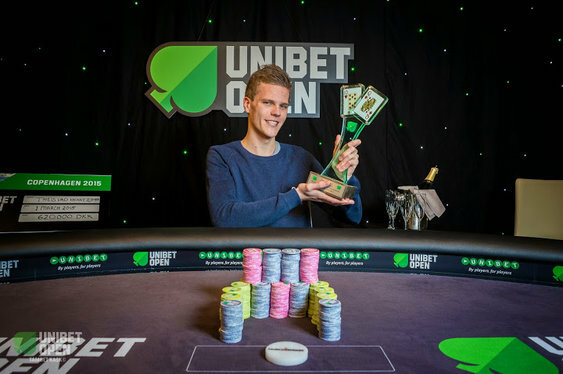 Theis Vad Hennebjerre was the poker prince of Denmark this weekend after taking down the latest leg of the Unibet Open series in Copenhagen. The home player topped a 400-runner field in the Danish capital to walk away with a first prize of €83,115. Vad Hennebjerre started the final table with a slight chip lead and barely put a foot wrong during Sunday's finale. The poker gods were in a benevolent mood, giving the Dane pocket aces on three occasions. They were good enough to eliminate Bogdan Petrescu who was unlucky enough to have been given AK and then Pavlos Xanthopoulos who took a stand with A6 which failed to improve. Vad Hennebjerre made it a trifecta of eliminations later in the day, making a brave call after Nikolaj Seydel made a huge river shove. The rockets were plenty good enough against his compatriot's pocket 5s and gave him a big advantage heading into heads up play. The two-handed action didn't last long, with Vad Hennebjerre turning a straight and rivering a flush to beat the short-stacked Henrik Juncker's king high.